What Does YouTube’s New Live Streaming Mean for You? Guest author Ken Myers, takes us on a tour of YouTube’s live streaming service. Since its creation, YouTube has generated a great deal of interest worldwide from the online community. It has been a place to promote music, acting styles, news broadcasts and more. Throughout 2013, the media powerhouse worked on implementing the ability to live stream events from a user’s account. But what does this mean for you and the YouTube community? Further Promotional Tactics – There are many YouTube celebrities that relish in having more than half of a million subscribers watching their material. Although editing techniques are what add life and visual appeal at times, live streaming special events could drive the traffic to a channel exponentially. After all, live feeds have always been an attraction for various mediums, including traditional television.In the past, several events have been streamed live across the social media hub and were successful at engaging various viewers. Could this tactic help you promote your own business through the website? Bloopers Galore – Some actors have a difficult time maintaining their focus on camera. It’s not often that a show can be performed live and not have a great deal of mistakes. Watching these events live could provide you with greater entertainment, though, especially if your favorite celebrities are struggling to keep it together. On the other hand, this is also how a family movie can turn into an R-rated episode. If you plan on capitalizing on the live feed, you need to bring your A-game. Questionable Materials – Thanks to efforts by Google, you’re less likely to be able to produce material that is morally questionable without feeling some kind of repercussion. Although some people may try to take advantage of the live stream, it’s unlikely they’ll succeed at promoting this content. In order to provide a video for a live event, you need to have more than 1000 subscribers. This rule was implemented to ensure that you are serious about developing quality material for your viewers, making you less likely to take advantage of a live broadcast. If you can prove that you belong to a non-profit organization, you could begin streaming immediately. Compared to Other Streaming Services – Many live streaming services on the Internet have been developed to allow virtually anyone with a webcam to promote themselves. Unlike YouTube, these services often don’t have any requirements past the basic illegal and adult contracts you must agree to before using the service. Without having a single follower or subscriber, anyone is able to get on these systems and talk about anything. If you’ve ever been to one of these websites, you understand how the quality of the material is lacking. YouTube live streams, on the other hand, require you to have a sense of professionalism and to provide quality material. Engaging Your Subscribers – In order to grow a subscriber base, your material has to engaging. However, you have to begin producing videos to find out if people will find your content worthy of watching. To keep and increase your subscribers, you can further interact with them by developing a live stream and responding to questions on your Twitter account. This can increase both your viewership and your Twitter activity in a profound way. Of course, it helps to have a level of popularity before committing to a live broadcast of your show. Future Content – Although some YouTube celebrities may see the value in live streaming their broadcasts, many may still opt out of using those services. For instance, if you produce material that is effects driven, it’s far more difficult to provide the same level of entertainment value. Talk shows and gaming channels are more likely to take advantage of providing a live feed because of the nature of their content. Many popular YouTube shows are unedited as it is, so little would change in the way of creating a live stream or a regular upload for these people. For many, live streaming content may be nothing more than a pipe-dream. It takes a serious minded individual to develop content that is entertaining enough to draw in the necessary number of subscribers needed. For the rest of us, though, it may be an entertaining way to see our favorite YouTube celebrities sans the editing. Comments Off on What Does YouTube’s New Live Streaming Mean for You? The so called “War on Terror” has long since lost its luster and should be appropriately reclassified as The War of Terror. The U.S. has been singularly impudent in terrorizing the terrorists but instead, it has managed to terrorize the rest of the world using a system of surveillance schemes that have gone off the board. Chalk one up for Al Qaeda – the only winners in this debacle. In the meantime, Americans continue to live in fear – trading away freedoms for security in a war that is simple unwinnable. Obama, despite his assurances that he would “fight terrorism while maintaining our civil liberties” has been a principle mover in this assault on democracy. 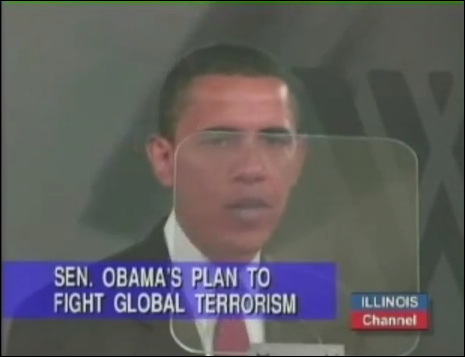 Obama, in a 2008 election sound bite, drew a sharp contrast with the Bush administration which he proclaimed, offered Americans “a false choice between the liberties we cherish and the security we demand.” And for good measure – for stooping “to spy on citizens who are not suspected of a crime.” It’s a surreal world we live in, is it not? But why be satisfied with my ramblings? Here’s the video. As America continues its slide into Fascism (eagerly joined in the venture by Canada, Australia, the U.K. and countless other self-advertised “democracies”), the justified expectation held by these governments is – you – yes, you – will take no active part in expressing your outrage at the escalating intrusions into your private life. Sadly, the undermining of democracy, or more to the point, democracy as we though we knew it, continues apace. As a consequence (hardly the only consequence, of course), encryption technology is once again in the spotlight. And no, using encryption does not mean that one has something to hide. Sophisticated and aware computer users know, that financial data and other confidential information, can easily be subject to intrusive viewing by those not authorized to do so. Internet malware attack: Increasingly, statistics reinforce the fact that financial data continues to be targeted by hackers/information thieves, for the purpose of identity theft. Contrast that reality with these facts; there is no such thing as a totally secure Internet connected computer. All Internet connected computers are subject to attack and compromise. Lost or stolen Laptop: How often have we read the following – 200,00 (insert your own number here), bank account numbers, Social Insurance Numbers, names, addresses and dates of birth were on a laptop stolen/lost earlier this week. In too many of these cases, negligently, the data is unencrypted. Certainly Laptop theft or loss is not restricted to organizations; it can just as easily happen to you. Lost or stolen USB drive: Since USB flash drives are so portable, you can take a drive virtually anywhere. Just like most items that are portable and that you carry with you, this type of drive can be lost, or stolen. To reduce or eliminate the security threat of sensitive data exposure then, the most prudent course of action is data encryption. Essentially, data encryption is a secure process for keeping your sensitive and confidential information private. It’s a process by which bits of data are mathematically jumbled with a password-key. The Encryption process makes the data unreadable unless, or until, decrypted. It happens to us all: Just this past week, I lost not only my house keys (first time ever) – but the USB key attached to the keychain. If you guessed that the drive was encrypted – take a bow. 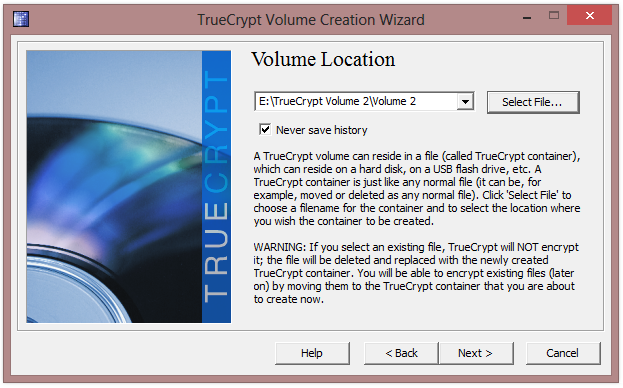 TrueCrypt is an outstanding free open source software application for establishing and maintaining an on-the-fly-encrypted volume. On-the-fly encryption simply means that data are automatically encrypted, or decrypted, just before they are loaded or saved – without any user intervention. The program automatically and transparently encrypts in real time. No data stored on an encrypted volume can be read (decrypted) without the correct password/key file or correct encryption keys. 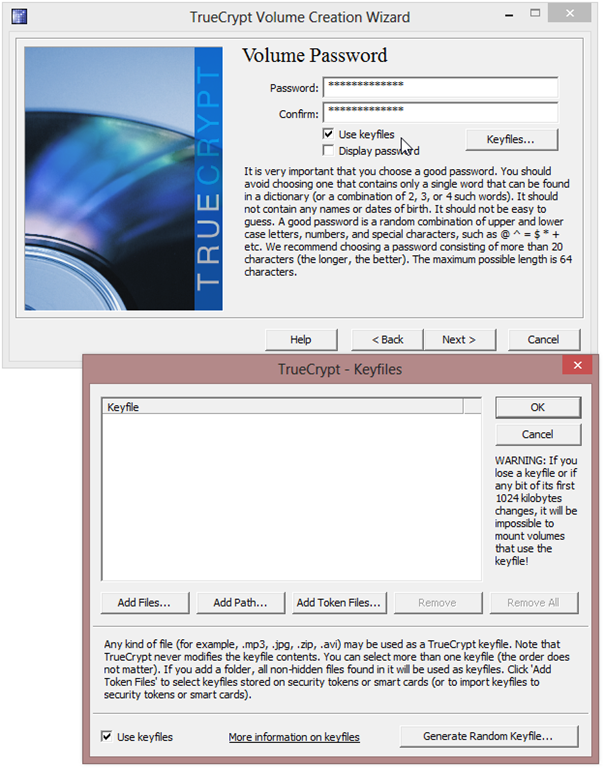 The entire file system is encrypted (i.e., file names, folder names, contents, free space, Meta data, etc.). 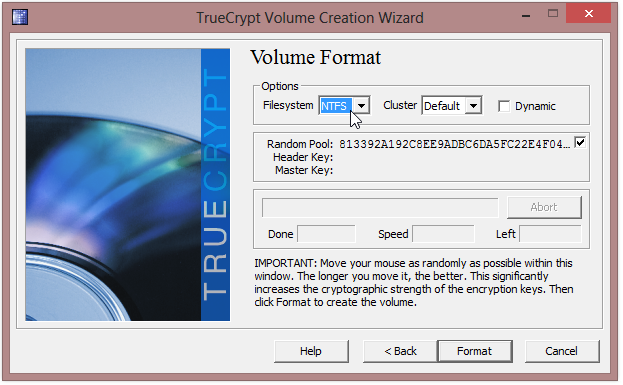 Files can be copied to and from a mounted TrueCrypt volume just like they are copied to/from any normal disk (for example, by simple drag-and-drop operations). 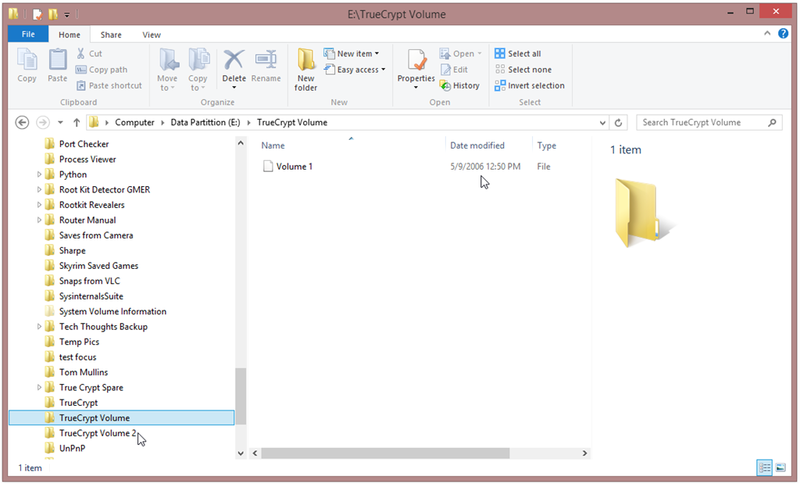 When you turn off your computer, the volume will be dismounted and files stored in the volume will be inaccessible and encrypted. You may of course, manually dismount the volume. 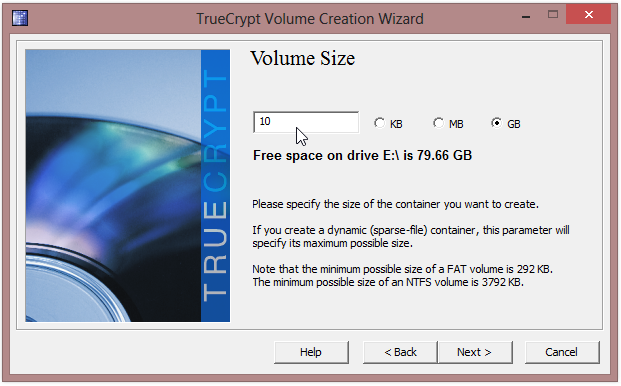 TrueCrypt offers a number of options – you can store your encrypted data in files, partitions, or on a portable storage device such as a USB flash drive. Installation is simple and straightforward – no gotchas here. Lots of steps – but easy steps. If you choose “Keyfiles”, be sure you understand the ramifications. This is an extra security step which has limited application for a home user. You do not need to select this option. And – Win 8’s File Explorer reports that the volume has been setup successfully. If you expand the graphic below (click), you’ll also notice my first TrueCrypt volume on this HD from May 9, 2006. Indicative of this application’s popularity is the fact that it is downloaded tens of thousands of times each day, across the Internet. I’ve been using TrueCrypt for a number of years, and I have developed a lot of confidence in this outstanding application. If you determine that encryption of your sensitive data is a priority, I highly recommend that you give TrueCrypt a try. The FBI has admitted defeat in attempts to break the open source encryption used to secure hard drives seized by Brazilian police during a 2008 investigation. System Requirements: Win 8, Win 7, Vista, XP, Mac OS X, and Linux. 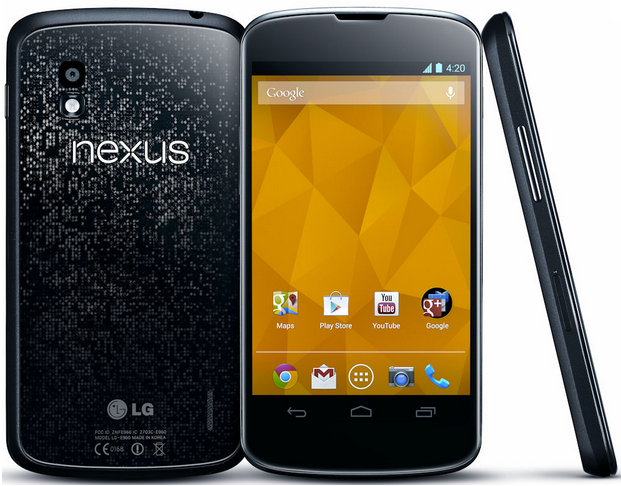 Google Nexus 4 – The Best Android Device Ever? Google’s Nexus 4 might just be the best Android device around. Guest writer Allison Foster walks you through a comprehensive overview – see what you think. In keeping with the aesthetics and innovative features of its bigger brothers, the Google Nexus 4 is a smartphone to contend with. This device has the technological benefits of the tablet line condensed into a small pocket version with access to telecommunications. Providing overwhelming graphic capabilities as well as processing power, the Nexus 4 is loaded with the hardware it needs in order to accomplish virtually any task. It is a phone that can engage a person on a variety of levels whether it is for entertainment, professional, or personal use. 1. Display – Using a 4.7-inch display, the Google Nexus 4 runs at a resolution of 1280×768 with 320 pixels per inch. This provides an amazing clarity for video and graphics, making it ideal for streaming movies or playing games. Operating at such resolutions also makes web browsing ideal as one would be able to see the website as it would be on a desktop computer system or view the condensed site if it had been optimized for smartphones. Protected by Corning Gorilla Glass 2, one could feel comfortable with carrying the Nexus 4 in his or her pocket without worry of keys or other materials scratching the glass. 2. Connections – The Google Nexus 4 is compatible with a number of carriers as it uses GSM, EDGE, and GPRS on 850, 900, 1800, and 1900MHz bands. This unlocked smartphone is capable of using 3G networks, support for more than 200 service carriers, and can connect to virtually any wireless access point supporting 802.11 a/b/g/n. As an added bonus, Bluetooth and Android Beam technologies increase connectivity across millions of devices. Keeping true to using innovative technologies, the Google Nexus 4 is capable of wireless charging. This form of replenishment is also called inductive charging and uses electromagnetic fields in order to transfer energy from a charging base to the receiving unit. This technology has been utilized in the past in key-cards and readers. The Google Nexus 4 is a premier phone that is built for longevity and multitasking. With access to apps such as Google Play, Netflix, and more this phone can provide a wealth of entertainment and communication wrapped in the sleek and elegant design of its chassis. This impressive addition to the Nexus family is more than a simple smartphone; it’s a tool of unlimited possibilities. Blogging was a natural progression for Allison once she graduated from college, as it allowed her to combine her two passions: writing and children. She has enjoyed furthering her writing career with www.nannyclassifieds.com. She can be reached through e-mail – allisonDOTnannyclassifiedsATgmail – the rest you know. 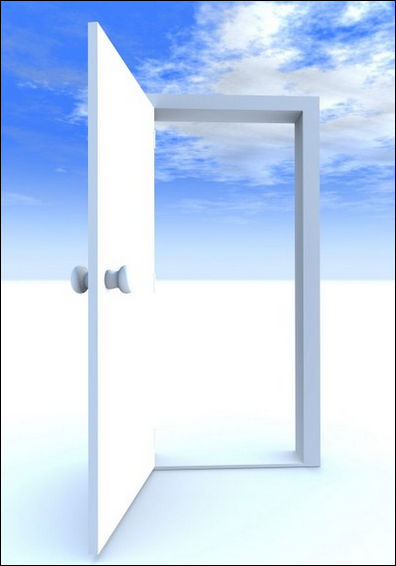 I’m not in the habit of leaving the door to my home wide open – unlocked perhaps – depending on circumstances. But wide open? No. Nor, have I ever developed the habit of leaving my Internet connection wide open – unless I have a need to do so. Otherwise – I break the connection. My Tablet computer is subject to the same set of rules. Unless I’m actively engaged with the Internet – off goes the Wi-Fi. As a one-time user, and a big fan of the free ZoneAlarm Firewall (since the “olden days”), disconnecting from the Internet was as simple as flicking a switch from within the ZoneAlarm GUI – “Stop All Internet Activity”. Until, that is, ZoneAlarm underwent “improvement” to the point that it became useless for my needs. But, that’s another story. 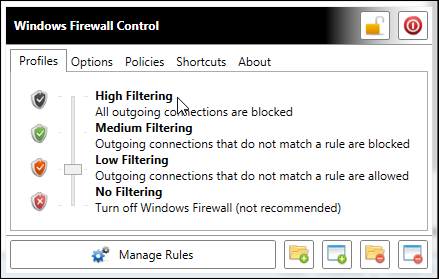 Next up, on the Firewall scene, was PC Tools Firewall Plus which offered the same – “switch off” capabilities. Unhappily though, PC Tools Firewall Plus, went the way of the Dodo Bird (on Windows 8) – at least as a stand alone application. Now running to catch up, I finally relented and activated Windows 8 internal firewall which, with the addition of the freebie application, Windows Firewall Control, suits my needs – for now. Still, this is a fairly clunky method to accomplish a simple task such as shutting down a Network Adapter (Ethernet Card) – there has to be a better way. Other than pulling the Cat 5 cable. And, there is. 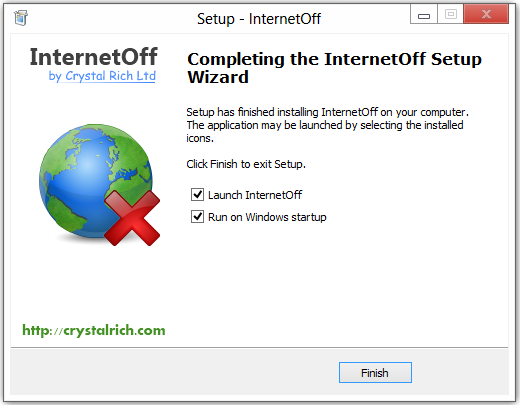 Regular reader Hipockets, has reminded me (thank you Sir) that the freebie application – InternetOff – is designed to do just that – turn off an Internet connection. A couple of clicks …….. Following the installation, you’ll find a “Globe” icon in the system tray which when activated, will bring up ……. Click – and you’re done – as shown in the following screen captures. Reverse the process and, you’re back online. Quick, simple, and painless. System requirements: Windows 2000, XP, Vista, Win7, 32/64 bit (Tested on Win 8/32 bit under which the application must be run as an administrator). Download at: The developer’s site. From the – “he got there first files.” Good friend and fellow blogger, Rick Robinette, posted on this application previously. You’ll enjoy reading Rick’s take on this neat little freebie. In today’s guest post, Estelle Shumann explores the recent advances made in online education and the steps still needed before online education will be a viable and secure platform. 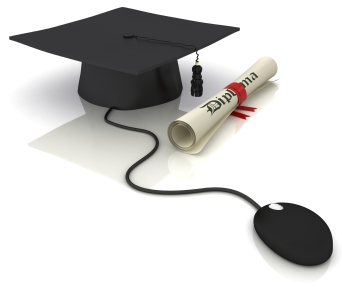 Online education has taken enormous strides in 2012. If progress continues at this pace, there may soon be a low-cost, high-quality alternative to traditional education widely available to students of every stripe. In fact, free learning may become a possibility for everyone with an Internet Service Provider (ISP) and computer or mobile device. In this article, we will take a look at some of the big milestones reached, as well as the areas that need improvement before learning becomes completely democratized. Why was 2012 such a groundbreaking year? Firstly, Internet connection speeds have increased, so most people can stream video easily and without interruption. This format allows professors to speak directly to students, even if they are thousands of miles apart. As studies and experience have shown, there is simply no decent alternative to watching and listening to a real person discuss a topic. Tone of voice, gestures, and demeanor are crucial to the successful transmission of complex ideas. Moreover, recent experiments have demonstrated that classes are more successful when offered in real-time segments. Lectures may be recorded, but are released on a weekly or bi-weekly basis. The past decade has allowed institutions to gain experience with online class environments, making them more efficient and effective. The University of Phoenix and Khan Academy are no longer the only entities trying out new ideas. There are now a vast number of traditional universities experimenting with online education. Stanford University has been a pioneer in this arena offering online classes for over a decade. MIT started offering open courseware in 2011, which gave anyone interested access to video-lectures, assignments, tests, and quizzes. In the fall of 2012, MIT and Harvard will join forces and offer a combined platform, called EdX. Also in 2012, a team of Stanford professors came together and went live with Coursera, a collaborative approach to online education that allows any university to join and offer free classes through its website. Thus far, 16 universities have joined, including Stanford University, Princeton University, University of Pennsylvania, and University of Michigan. Institutions in France, Canada, and the United Kingdom have also joined what is now an international effort. These universities are adding their prestige and pull to Coursera and online education in general. Despite the advances in online education, there remain some large problems to solve before it will become universally useful to consumers. One major issue involves certification and assessments. Many classes on Coursera, for example, offer certificates signed by professors, but the value of these remains dubious. The reputation of these certificates is hampered by the possibility of hacking and cheating. It would be impossible for these universities to monitor individual students and ensure fairness. Until there is a secure way to know that students have completed their own work without external help, online classes will not mean very much to prospective employers. Also problematic is the limitation of single-course offerings. In order to prepare for a profession in the real world, students need to earn some type of certification or degree, which requires a prescribed set of completed classes. Thus, students may still need to attend traditional university programs if they want to significantly improve their earning potential. Online classes fail to meet the goal of democratizing the education system, but they are progressing rapidly. Writing for the education resource OnlineSchools.org, Estelle is familiar with the benefits and drawbacks of both online and traditional schools. Estell’s article builds on a December 2011 post from Bill Mullins’ Weblog, which suggests that online education resources like Khan Academy are proof that the content of online course offerings remains more important than the method of delivery. AV-killing worm spreads via Facebook chat and IM clients – A rather industrious piece of malware that – among other things – paves the way for other malware by disabling AV solutions and software update modules has been spotted spreading via several Instant Messaging applications (ICQ, Skype, GTalk, Pidgin, MSN, YIM) and Facebook. The victims receive a message from an unknown user, offering a link to a funny or interesting video. If they follow it, the malware in question downloads automatically from the linked site and is executed. Nothing new here – as any one of the 10 or more articles I’ve written over the years on using Instant Messenger applications safely will attest to. 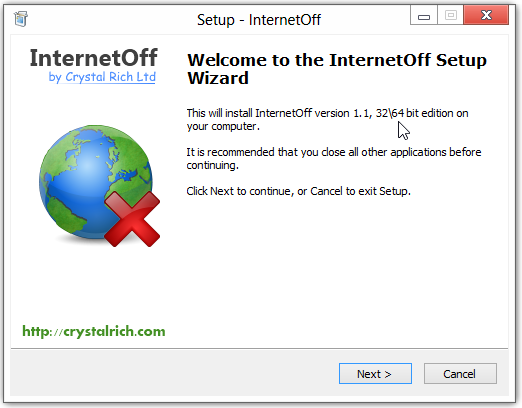 The following post (originally published September 4, 2010) will serve as a quick refresher on how to navigate the Internet safely while using an Instant Messenger client. In a recent Symantec survey, which questioned computer users on the most likely routes cybercriminals use to drop malware on unsuspecting users, one resultant statistic made me sit up a little straighter. Just 3.9% of survey participants believed that Instant Messenger applications had a role in malware distribution. Given the frequency with which instant messaging is used to distribute malware (recent statistics indicate almost 50% of worms use this method to spread), I was more than a little surprised at this unrealistic response. The reality is, from a security perspective Instant Messaging applications can present considerable security risks. Security breakdowns can occur when these programs are used to share files, folders, or in some cases, entire drives. Instant messaging, unfortunately, is a primary channel used by cyber-criminals to distribute malware and scams. 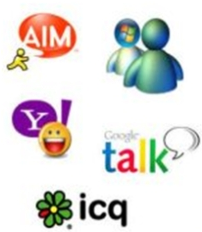 Programs such as MSN Messenger, Yahoo! Messenger, AIM, and a basket full of other IM applications, are extremely popular with users who want real-time contact with each other and (no surprise here), this makes them the perfect vehicle for cyber criminals. Hackers use two methods of delivering malicious code through IM: delivery of virus, Trojan, or spy ware within an infected file, and the use of “socially engineered” text with a web address that entices the recipient to click on a URL which connects to a website that downloads malicious code. Viruses, worms, and Trojans then typically propagate, by sending themselves rapidly through the infected user’s buddy list. The following is a series of sensible tips for users to get the most out of these programs, securely and responsibly. As with any other application you use on the Internet, having the knowledge that allows you to use it safely, and being aware of current threats, will make for a more positive experience when using these wildly popular applications. Don’t click on links, or download files from unknown sources. You need to be alert to the dangers in clicking on links, or downloading files from sources that are not known to you. Even if the files or links apparently come from someone you know, you have to be positive that it really was this person who has sent the message. Check with your contact to be sure the files, or links are genuine. Remember, if you click on those links, or run those attachments without confirmation, you run the risk of letting malware into your computer. Use only secure passwords, and be sure to change them regularly. The longer and more varied they are – using a variety of different characters and numbers – the more secure they will be. Protect personal and confidential information when using IM. Revealing confidential or personal information in these types of conversations, can make you an easy target for Internet predators. For added protection when using a public computer, ensure that you disable any features that retain login information to prevent other users from gaining access to your instant messaging once you leave. It’s virtually impossible to avoid publishing your email address on the Internet, however do so only when absolutely necessary. Cyber criminals are always on the lookout for accounts to target.